In view of the current hysteria about the connection between wildfires and “climate change”, I must point readers to a three-month-old post The connection is nil, just like the bogus connection between tropical cyclone activity and “climate change”. There are lots of reasons to disbelieve in “climate change”, that is, a measurable and statistically significant influence of human activity on the “global” temperature. Many of the reasons can be found at my page on the subject — in the text, the list of related readings, and the list of related posts. Here’s the main one: Surface temperature data — the basis for the theory of anthropogenic global warming — simply do not support the theory. It arises from projecting a sampling of the fluctuating temperature field of the Earth onto a single number (e.g. , ) at discrete monthly or annual intervals. Proponents claim that this statistic represents a measurement of the annual global temperature to an accuracy of ±0.05 ◦C (see ). Moreover, they presume that small changes in it, up or down, have direct and unequivocal physical meaning. The word “sampling” is important because, statistically, a sample has to be representative of a population. There is no way that a sampling of the “fluctuating temperature field of the Earth,” is possible…. … The reality is we have fewer stations now than in 1960 as NASA GISS explain (Figure 1a, # of stations and 1b, Coverage)…. Not only that, but the accuracy is terrible. US stations are supposedly the best in the world but as Anthony Watt’s project showed, only 7.9% of them achieve better than a 1°C accuracy. Look at the quote above. It says the temperature statistic is accurate to ±0.05°C. In fact, for most of the 406 years when instrumental measures of temperature were available (1612), they were incapable of yielding measurements better than 0.5°C. 19% of the land surface that is grassland. The result is we have inadequate measures in terms of the equipment and how it fits the historic record, combined with a wholly inadequate spatial sample. The inadequacies are acknowledged by the creation of the claim by NASA GISS and all promoters of anthropogenic global warming (AGW) that a station is representative of a 1200 km radius region. I plotted an illustrative example on a map of North America (Figure 2). Notice that the claim for the station in eastern North America includes the subarctic climate of southern James Bay and the subtropical climate of the Carolinas. However, it doesn’t end there because this is only a meaningless temperature measured in a Stevenson Screen between 1.25 m and 2 m above the surface…. The Stevenson Screen data [are] inadequate for any meaningful analysis or as the basis of a mathematical computer model in this one sliver of the atmosphere, but there [are] even less [data] as you go down or up. The models create a surface grid that becomes cubes as you move up. The number of squares in the grid varies with the naïve belief that a smaller grid improves the models. It would if there [were] adequate data, but that doesn’t exist. The number of cubes is determined by the number of layers used. Again, theoretically, more layers would yield better results, but it doesn’t matter because there are virtually no spatial or temporal data…. So far, I have talked about the inadequacy of the temperature measurements in light of the two- and three-dimensional complexities of the atmosphere and oceans. However, one source identifies the most important variables for the models used as the basis for energy and environmental policies across the world. The last line is critical and yet impossible. The temperature data [are] the best we have, and yet [they are] completely inadequate in every way. Pick any of the variables listed, and you find there [are] virtually no data. The answer to the question, “what are we really measuring,” is virtually nothing, and what we measure is not relevant to anything related to the dynamics of the atmosphere or oceans. I am especially struck by Dr. Ball’s observation that the surface-temperature record applies to about 15 percent of Earth’s surface. Not only that, but as suggested by Dr. Ball’s figure 2, that 15 percent is poorly sampled. Take the National Weather Service station for Austin, Texas, which is located 2.7 miles from my house. The station is on the grounds of Camp Mabry, a Texas National Guard base near the center of Austin, the fastest-growing large city in the U.S. The base is adjacent to a major highway (Texas Loop 1) that traverses Austin. The weather station is about 1/4 mile from the highway,100 feet from a paved road on the base, and near a complex of buildings and parking areas. As I have shown elsewhere, the general rise in temperatures recorded at the weather station over the past several decades is fully explained by the urban-heat-island effect due to the rise in Austin’s population during those decades. Further, there is a consistent difference in temperature and rainfall between my house and Camp Mabry. My house is located farther from the center of Austin — northwest of Camp Mabry — in a topographically different area. The topography in my part of Austin is typical of the Texas Hill Country, which begins about a mile east of my house and covers a broad swath of land stretching as far as 250 miles from Austin. The contrast is obvious in the next photo. Camp Mabry is at the “1” (for Texas Loop 1) near the lower edge of the image. Topographically, it belongs with the flat part of Austin that lies mostly east of Loop 1. It is unrepresentative of the huge chunk of Austin and environs that lies to its north and west. Getting down to cases. I observed that in the past summer, when daily highs recorded at Camp Mabry hit 100 degrees or more 52 times, the daily high at my house reached 100 or more only on the handful of days when it reached 106-110 at Camp Mabry. That’s consistent with another observation; namely, that the daily high at my house is generally 6 degrees lower than the daily high at Camp Mabry when it is above 90 degrees there. As for rainfall, my house seems to be in a different ecosystem than Camp Mabry’s. Take September and October of this year: 15.7 inches of rain fell at Camp Mabry, as against 21.0 inches at my house. The higher totals at my house are typical, and are due to a phenomenon called orographic lift. It affects areas to the north and west of Camp Mabry, but not Camp Mabry itself. So the climate at Camp Mabry is not my climate. Nor is the climate at Camp Mabry typical of a vast area in and around Austin, despite the use of Camp Mabry’s climate to represent that area. 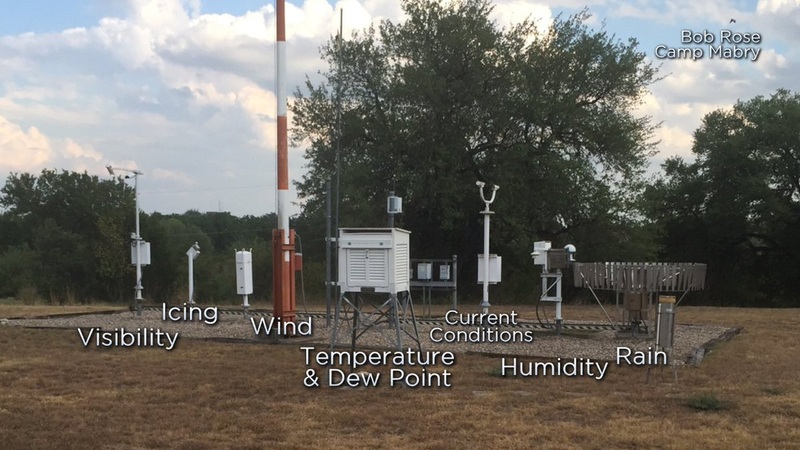 There is another official weather station at Austin-Bergstrom International Airport, which is in the flatland 9.5 miles to the southeast of Camp Mabry. Its rainfall total for September and October was 12.8 inches — almost 3 inches less than at Camp Mabry — but its average temperatures for the two months were within a degree of Camp Mabry’s. Suppose Camp Mabry’s weather station went offline. The weather station at ABIA would then record temperatures and precipitation even less representative of those at my house and similar areas to the north and west. The correlation coefficient is highly significant, given the huge sample size. Note that the relationship is between precipitation in a given month and temperature a month later. Although cloud cover (and thus precipitation) has an immediate effect on temperature, precipitation has a residual effect in that wet ground absorbs more solar radiation than dry ground, so that there is less heat reflected from the ground to the air. The lagged relationship is strongest at 1 month, and considerably stronger than any relationship in which temperature leads precipitation. Clouds have a net average cooling effect on the earth’s climate. 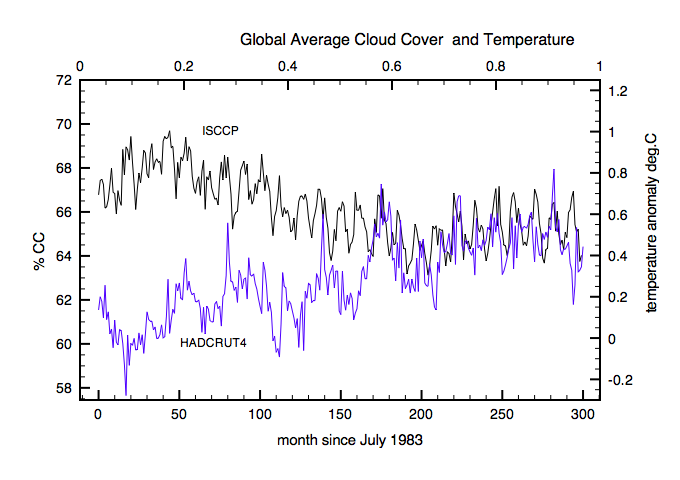 Climate models assume that changes in cloud cover are a feedback response to CO2 warming. Is this assumption valid? Following a study withEuan Mearns showing a strong correlation in UK temperatures with clouds, we looked at the global effects of clouds by developing a combined cloud and CO2 forcing model to sudy how variations in both cloud cover  and CO2  data affect global temperature anomalies between 1983 and 2008. The model as described below gives a good fit to HADCRUT4 data with a Transient Climate Response (TCR )= 1.6±0.3°C. The 17-year hiatus in warming can then be explained as resulting from a stabilization in global cloud cover since 1998. An excel spreadsheet implementing the model as described below can be downloaded from http://clivebest.com/GCC. In view of Hurricane Michael, and the attendant claims about the role of “climate change”, I have updated “Hurricane Hysteria“. 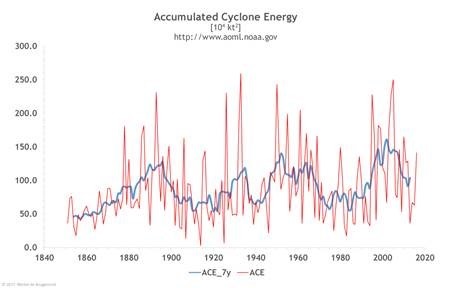 The bottom line remains the same: Global measures of accumulated cyclone energy (ACE) do not support the view that there is a correlation between “climate change” and tropical cyclone activity. Estimates of the number of fires are from National Fire Protection Association, Number of Fires by Type of Fire. Specifically, the estimates are the sum of the columns for “Outside of Structures with Value Involved but no vehicle (outside storage crops, timber, etc)“ and “Brush, Grass, Wildland (excluding crops and timber), with no value or loss involved”. Estimates of the global temperature anomalies are annual averages of monthly satellite readings for the lower troposphere, published by the Earth Science System Center of the University of Alabama-Huntsville. I’ve been trying to find wandering classmates as the 60th anniversary of our graduation from high school looms. Not all are enthusiastic about returning to our home town in Michigan for a reunion next August. Nor am I, truth be told. A sunny, August day in Michigan is barely warm enough for me. I’m far from alone in holding that view, as anyone with a casual knowledge of inter-State migration knows. Take my graduating class, for example. Of the 79 living graduates whose whereabouts are known, 45 are still in Michigan; 24 are in warmer States (Arizona, California, Florida, Georgia, Kentucky, Louisiana, Mississippi, Tennessee, and Texas — moi); and 10 (inexplicably) have opted for other States at about the same latitude. In sum: 30 percent have opted for warmer climes; only 13 percent have chosen to leave a cold State for another cold State. It would be a good thing if the world were warming a tad, as it might be. Yes, hurricanes are bad things when they kill and injure people, destroy property, and saturate the soil with seawater. But hurricanes are in the category of “stuff happens”. Contrary to the true believers in catastrophic anthropogenic global warming (CAGW), hurricanes are not the fault of human beings. Hurricanes are not nature’s “retribution” for mankind’s “sinful” ways, such as the use of fossil fuels. How do I know? Because there are people who actually look at the numbers. See, for example, “Hate on Display: Climate Activists Go Bonkers Over #Irma and Nonexistent Climate Connection” by Anthony Watts (Watts Up With That?, September 11, 2017). See also Michel de Rougement’s “Correlation of Accumulated Cyclone Energy and Atlantic Multidecadal Oscillations” (Watts Up With That?, September 4, 2017). The total energy accumulated each year by tropical storms and hurricanes (ACE) is also showing such a cyclic pattern. NOAA’s Hurricane Research Division explanations on ACE: “the ACE is calculated by squaring the maximum sustained surface wind in the system every six hours (knots) and summing it up for the season. It is expressed in 104 kt2.” Direct instrumental observations are available as monthly series since 1848. A historic reconstruction since 1851 was done by NOAA (yearly means). A correlation between ACE and AMO [Atlantic Multidecadal Oscillation] is confirmed by regression analysis. Figure 3 Correlation ACE=f(AMO), using the running averages over 7 years. 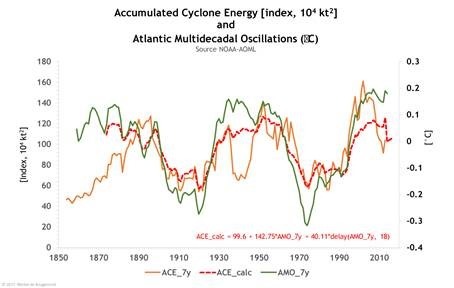 AMO: yearly means of the Atlantic Multidecadal Oscillations ACE_7y: yearly observed accumulated cyclone energy ACE_calc: calculated ACE by using the indicated formula. Thus, a simple, linear relation ties ACE to AMO, in part directly, and in part with an 18 years delay. The correlation coefficient is astonishingly good. … Anastasios Tsonis, emeritus distinguished professor of atmospheric sciences at the University of Wisconsin-Milwaukee, describes new and cutting-edge research into natural climatic cycles, including the well known El Nino cycle and the less familiar North Atlantic Oscillation and Pacific Decadal Oscillation. He shows how interactions between these ocean cycles have been shown to drive changes in the global climate on timescales of several decades. We can show that at the start of the 20th century, the North Atlantic Oscillation pushed the global climate into a warming phase, and in 1940 it pushed it back into cooling mode. The famous “pause” in global warming at the start of the 21st century seems to have been instigated by the North Atlantic Oscillation too. In fact, most of the changes in the global climate over the period of the instrumental record seem to have their origins in the North Atlantic. Tsonis’ insights have profound implications for the way we view calls for climate alarm. It may be that another shift in the North Atlantic could bring about another phase shift in the global climate, leading to renewed cooling or warming for several decades to come. These climatic cycles are entirely natural, and can tell us nothing about the effect of carbon dioxide emissions. But they should inspire caution over the slowing trajectory of global warming we have seen in recent decades. While humans may play a role in climate change, other natural forces may play important roles too. It’s certainly doubtful that NOAA’s reconstruction of ACE is accurate and consistent as far back as 1851. I hesitate to give credence to a data series that predates the confluence of satellite observations, ocean-buoys, and specially equipped aircraft. The history of weather satellites casts doubt on the validity of aggregate estimates for any period preceding the early 1960s. As it happens, the data sets for tropical cyclone activity that are maintained by the Tropical Meteorology Project at Colorado State University cover all six of the relevant ocean basins as far back as 1972. The coverage goes back to 1961 (and beyond) for all but the North Indian Ocean basin — which is by far the least active. The recent spikes in ACE are not unprecedented. And there are many prominent spikes that predate the late-20th-century temperature rise on which “warmism” is predicated. The trend from the late 1800s to the present is essentially flat. And, again, the numbers before the early 1960s must understate ACE. The red line is the sum of ACE for all six basins, including the Northwest Pacific basin; the yellow line in the sum of ACE for the next five basins, including the Northeast Pacific basin; etc. If one is a believer in CAGW (the G stands for global), it is a lie (by glaring omission) to focus on random, land-falling hurricanes hitting the U.S. or other parts of the Western Hemisphere. The overall level of activity is practically flat between 1972 and 2017, with the exception of spikes that coincide with strong El Niño events. There is nothing in the long-term record for the North Atlantic basin, which is probably understated before the early 1960s, to suggest that global activity in recent decades is unusually high. I am very sorry for the victims of Michael, Florence, Harvey, Irma, and every weather-related disaster — and every disaster, whether man-made or not. But I am not about to reduce my carbon footprint because of the Luddite hysterics who dominate and cling to the quasi-science of climatology. If all of the hysterics truly believe that a failure to reduce CO2 emissions will result in catastrophic global warming, they have it within their power to reduce emissions drastically. They can start by getting rid of their cars in favor of bikes and horses, moving to smaller homes, doing without air conditioning, keeping their homes at 50 degrees in the winter, bathing and washing clothes in cold water, growing and raising their own foodstuffs (to eliminate transportation-based emissions), reading by candle light, and throwing out all of their electrical appliances — even including their smart phones, which rely on electrically powered systems. Given the number of hysterics out there, I’m sure that the (non) CO2 problem would be solved in no time. If their grandparents, great-grandparents, and all who came before them could live a CO2-minimal life, why can’t a few billion true-blue saviors of the world do the same? An occasional survey of web material that’s related to subjects about which I’ve posted. Links to the other posts in this series may be found at “Favorite Posts,” just below the list of topics. [A] law produces not only one effect, but a series of effects. Of these effects, the first alone is immediate; it appears simultaneously with its cause; it is seen. The other effects emerge only subsequently; they are not seen; we are fortunate if we foresee them. This might also be called the law of unintended consequences. It explains why so much “liberal” legislation is passed: the benefits are focused a particular group and obvious (if overestimated); the costs are borne by taxpayers in general, many of whom fail to see that the sum of “liberal” legislation is a huge tax bill. Obamacare, and no statistically significant improvement in self-reported health since the law went into effect…. In a theoretical sense, we can always work to make the environment “cleaner”, that is, reduce human pollution. So, any attempts to reduce the EPA’s efforts will be viewed by some as just cozying up to big, polluting corporate interests. As I heard one EPA official state at a conference years ago, “We can’t stop making the environment ever cleaner”. It was relatively inexpensive to design and install scrubbers on smokestacks at coal-fired power plants to greatly reduce sulfur emissions. The cost was easily absorbed, and electricty rates were not increased that much. The same is not true of carbon dioxide emissions. Efforts to remove CO2 from combustion byproducts have been extremely difficult, expensive, and with little hope of large-scale success. There is a saying: don’t let perfect be the enemy of good enough. In the case of reducing CO2 emissions to fight global warming, I could discuss the science which says it’s not the huge problem it’s portrayed to be — how warming is only progressing at half the rate forecast by those computerized climate models which are guiding our energy policy; how there have been no obvious long-term changes in severe weather; and how nature actually enjoys the extra CO2, with satellites now showing a “global greening” phenomenon with its contribution to increases in agricultural yields. But it’s the economics which should kill the Clean Power Plan and the alleged Social “Cost” of Carbon. Not the science. There is no reasonable pathway by which we can meet more than about 20% of global energy demand with renewable energy…the rest must come mostly from fossil fuels. Yes, renewable energy sources are increasing each year, usually because rate payers or taxpayers are forced to subsidize them by the government or by public service commissions. But global energy demand is rising much faster than renewable energy sources can supply. So, for decades to come, we are stuck with fossil fuels as our main energy source. For [Dreher], the only response that still remains is to form intentional communities amid the neo-barbarians to “provide an unintentional political witness to secular culture,” which will overwhelm the barbarian by the “sheer humanity of Christian compassion, and the image of human dignity it honors.” He believes that setting up parallel structures inside society will serve to protect and preserve Christian communities under the new neo-barbarian dispensation. We are told we should work with the political establishment to “secure and expand the space within which we can be ourselves and our own institutions” inside an umbrella of religious liberty. Statistically speaking, I am much more at risk of being killed when I get into my car than when I walk in the streets of the capital cities that I visit. Yet this fact, no matter how often I repeat it, does not reassure me much; the truth is that one terrorist attack affects a society more deeply than a thousand road accidents…. The Greatest tried to compensate for their own privations by giving their children what they, the parents, had never had in the way of material possessions and “fun”. And that is where the Greatest Generation failed its children — especially the Baby Boomers — in large degree. A large proportion of Boomers grew up believing that they should have whatever they want, when they want it, with no strings attached. Thus many of them divorced, drank, and used drugs almost wantonly…. The Greatest Generation — having grown up believing that FDR was a secular messiah, and having learned comradeship in World War II — also bequeathed us governmental self-indulgence in the form of the welfare-regulatory state. Meddling in others’ affairs seems to be a predilection of the Greatest Generation, a predilection that the Millenials may be shrugging off. We owe the Greatest Generation a great debt for its service during World War II. We also owe the Greatest Generation a reprimand for the way it raised its children and kowtowed to government. Respect forbids me from delivering the reprimand, but I record it here, for the benefit of anyone who has unduly romanticized the Greatest Generation. The rot set after World War II. The Taylorist techniques of industrial production put in place to win the war generated, after it was won, an explosion of prosperity that provided every literate American the opportunity for a good-paying job and entry into the middle class. Young couples who had grown up during the Depression, suddenly flush (compared to their parents), were determined that their kids would never know the similar hardships. As a result, the Baby Boomers turned into a bunch of spoiled slackers, no longer turned out to earn a living at 16, no longer satisfied with just a high school education, and ready to sell their votes to a political class who had access to a cornucopia of tax dollars and no doubt at all about how they wanted to spend it…. I have long shared Tim’s assessment of the Boomer generation. Among the corroborating data are my sister and my wife’s sister and brother — Boomers all…. In his new book, he argues that their “reckless self-indulgence” is in fact what set the example for millennials. And he’s not the first person to suggest this. Back in 1976, journalist Tom Wolfe dubbed the young adults then coming of age the “Me Generation” in the New York Times, which is a term now widely used to describe millennials. But the baby boomers grew up in a very different climate to today’s young adults. When the generation born after World War Two were starting to make their way in the world, it was a time of economic prosperity. “For the first half of the boomers particularly, they came of age in a time of fairly effortless prosperity, and they were conditioned to think that everything gets better each year without any real effort,” Gibney explained to The Huffington Post. “So they really just assume that things are going to work out, no matter what. That’s unhelpful conditioning. Gibney puts forward the argument that boomers – specifically white, middle-class ones – tend to have genuine sociopathic traits. There’s a rise in temperatures [in Austin] between the 1850s and the early 1890s, consistent with the gradual warming that followed the Little Ice Age. The gap between the early 1890s and mid-19naughts seems to have been marked by lower temperatures. It’s possible to find several mini-trends between the mid-19naughts and 1977, but the most obvious “trend” is a flat line for the entire period…. Following the sudden jump between 1977 and 1980, the “trend” remains almost flat through 1997, albeit at a slightly higher level…. The sharpest upward trend really began after the very strong (and naturally warming) El Niño of 1997-1998…. Oh, wait! 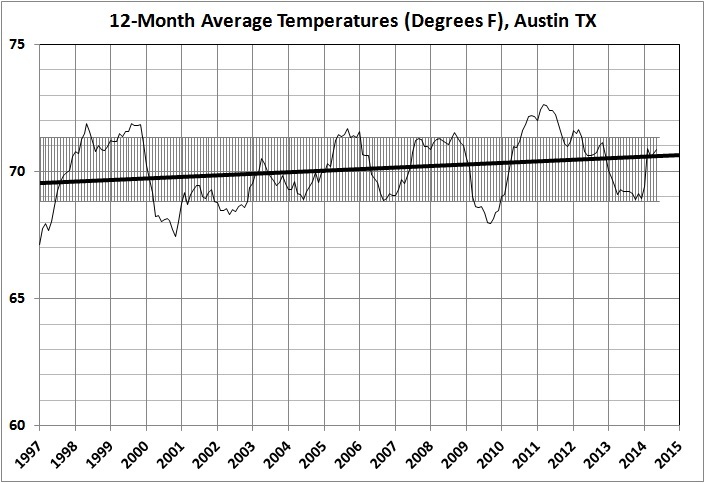 It turns out that Austin’s sort-of hot-spell from 1998 to the present coincides with the “pause” in global warming…. The rapid increase in Austin’s population since 2000 probably has caused an acceleration of the urban heat-island (UHI) effect. This is known to inflate city temperatures above those in the surrounding countryside by several degrees. What about drought? In Austin, the drought of recent years is far less severe than the drought of the 1950s, but temperatures have risen more in recent years than they did in the 1950s…. Why? Because Austin’s population is now six times greater than it was in the 1950s. The UHI effect has magnified the drought effect. Conclusion: Austin’s recent hot weather has nothing to do with AGW. I have annual population estimates for Austin from 1960 to the present. However, to tilt the scale in favor of AGW, I used values for 1968-2015, because the average temperature in 1968 was the lowest recorded since 1924. I reduced the official population figures for 1998-2015 to reflect a major annexation in 1998 that significantly increased Austin’s population. The statistical effect of that adjustment is to reduce the apparent effect of population on temperature — thus further tilting the scale in favor of AGW. The official National Weather Service station moved from Mueller Airport (near I-35) to Camp Mabry (near Texas Loop 1) in 1999. I ran the regression for 1968-2015 with a dummy variable for location, but that variable is statistically insignificant. The r-squared of the equation is 0.538, which is considerably better than the r-squared for a simple time trend (see the first graph below). Also, the standard error is 1.01 degrees; F = 2.96E-08; and the p-values on the variables and intercept are highly significant at 0.00313, 2.19E-08, and 7.34E-55, respectively. The author reports r-squared = 0.92 and SE = 0.7 degrees C (1.26 degrees F). The estimated UHI effect of Austin’s population growth from 1968 to 2015 is 2.99 degrees F. Given the standard error of the estimate, the estimate of 2.99 degrees isn’t significantly different from my estimate of 3.5 degrees or from the actual increase of 3.6 degrees. Bottom line: Austin’s temperature can be accounted for by precipitation and population. AGW will have to find another place in which to work its evil magic. “Climate change” is religion refracted through the lens of paganism. There is a hypothesis that the purported rise in global temperatures since 1850 (or some shorter span if you’re embarrassed by periods of notable decline after 1850) was or is due mainly or solely to human activity, as manifested in emissions of CO2. Adherents of this hypothesis call the supposed phenomenon by various names: anthropogenic global warming (AGW), just plain global warming, climate change, and climate catastrophe, for example. Those adherents loudly advocate measures that (they assert) would reduce CO2 emissions by enough to avoid climatic catastrophe. They have been advocating such measures for about 25 years, yet climate catastrophe remains elusive. (See “pause,” below.) But the true believers in AGW remain steadfast in their faith. Actually, belief in catastrophic AGW requires three leaps of faith. The first leap is to assume the truth of the alternative hypothesis — a strong and persistent connection between CO2 emissions and global temperatures — without having found (or even looked for) scientific evidence which disproves the null hypothesis, namely, that there isn’t a strong and persistent connection between CO2 emissions and global temperatures. The search for such evidence shouldn’t be confined to the near-past, but should extend centuries, millennia, and eons into the past. The problem for advocates of AGW is that a diligent search of that kind works against the alternative hypothesis and supports the null hypothesis. As a result, the advocates of AGW confine their analysis to the recent past and substitute kludgy computer models, full of fudge-factors, for a disinterested examination of the actual causes of climate change. There is strong evidence that such causes include solar activity and its influence on cloud formation through cosmic radiation. That truth is too inconvenient for the AGW mob, as are many other truths about climate. The second leap of faith is to assume that rising temperatures, whatever the cause, are a bad thing. This, despite the known advantages of warmer climates: longer growing seasons and lower death rates, to name but two. This is so because believers in AGW and policies that would (according to them) mitigate it, like to depict worst-case scenarios about the extent of global warming and its negative effects. Prominent among the leapers-of-faith in my neck of the woods is the “chief weathercaster” of an Austin TV station. We watch his weather forecasts because he spews out more information than his competitors, but I must resist the urge to throw a brick through my TV screen when his mask slips and he reveals himself as a true believer in AGW. What else should I expect from a weather nazi who proclaims it “nice” when daytime high temperatures are in the 60s and 70s, and who bemoans higher temperatures? Like any nazi, he projects his preferences onto others — in this case his viewership. This undoubtedly includes a goodly number of persons (like me) who moved to Austin and stay in Austin for the sake of sunny days when the thermometer is in the 80-to-95-degree range. It is a bit much when temperatures are consistently in the high 90s and low 100s, as they are for much of Austin’s summer. But that’s the price of those sunny days in the 80s and low 90s, unless you can afford to live in San Diego or Hawaii instead of Austin. The graph covers the period from April 1977 through April 2015. The jagged line represents 12-month averages of monthly averages for the official National Weather Service stations in Austin: Mueller Airport (until July 1999) and Camp Mabry (July 1999 to the present). (There’s a history of Austin’s weather stations in a NOAA document, “Austin Climate Summary.”) The upward trend is unmistakeable. Equally unmistakeable is the difference between the early and late years of the period — a difference that’s highlighted by the y-error bars, which represent a span of plus-and-minus one standard deviation from the mean for the period. Your first question should be “Why begin with April 1977?” Well, it’s a “good” starting point — if you want to sell AGW — because the 12-month average temperature as of April 1977 was the lowest in 64 years. After all, it was the seemingly steep increase in temperatures after 1970 that sparked the AGW business. What about the “fact” that temperatures have been rising since about 1850? The “fact” is that temperatures have been recorded in a relatively small number of locales continuously since the 1850s, though the reliability of the temperature data and their relationship to any kind of “global” average is in serious doubt. The most reliable data come from weather satellites, and those have been in operation only since the late 1970s. A recent post by Bob Tisdale, “New UAH Lower Troposphere Temperature Data Show No Global Warming for More Than 18 Years” (Watts Up With That?, April 29, 2015), summarizes the history of satellite readings, in the course of documenting the “pause” in global warming. The “pause,” if dated from 2001, has lasted 14 years; if dated from 1997, it has lasted 18 years. In either event, the “pause” has lasted about as long as the rise in late-20th century temperatures that led to the AGW hypothesis. 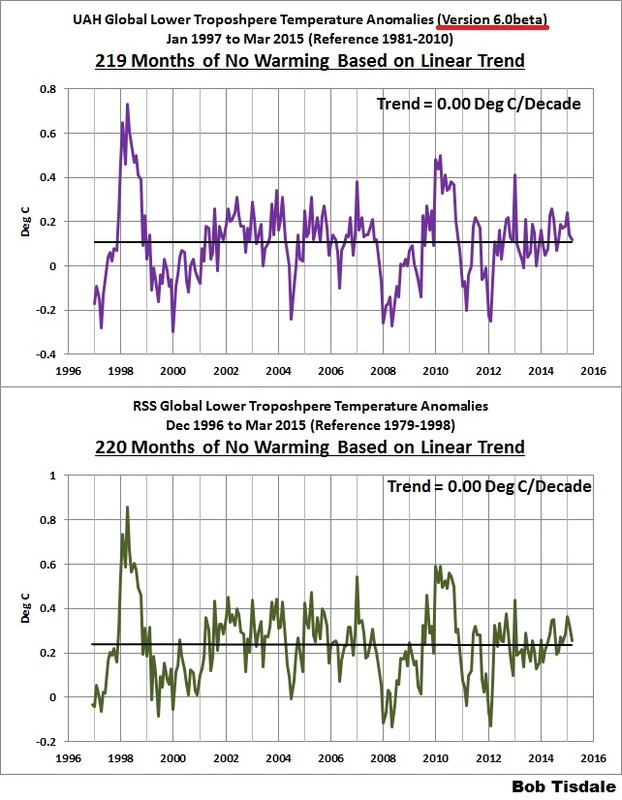 Source: Bob Tisdale, “New UAH Lower Troposphere Temperature Data Show No Global Warming for More Than 18 Years,” Watts Up With That?, April 29, 2015. What a revolting development this would be for our local weather nazi, if he could be bothered to acknowledge it. And if he did, he’d have to look beyond the egregious AGW hypothesis for an explanation of the warmer temperatures that he abhors. Where should he look? Here: the rapid increase in Austin’s population, combined with a drought. Conclusion: Austin’s recent hot weather has nothing to do with AGW. But don’t try to tell that to a weather nazi — or to the officials of the City of Austin, who lurch zombie-like onward in their pursuit of “solutions” to a non-problem. BE SURE TO READ THE SEQUEL, IN WHICH I QUANTIFY THE EFFECTS OF PRECIPITATION AND POPULATION, LEAVING NOTHING ON THE TABLE FOR AGW. Links to the other posts in this occasional series may be found at “Favorite Posts,” just below the list of topics. How Much Are Teachers Worth? [P]ublic “education” — at all levels — is not just a rip-off of taxpayers, it is also an employment scheme for incompetents (especially at the K-12 level) and a paternalistic redirection of resources to second- and third-best uses. And, to top it off, public education has led to the creation of an army of left-wing zealots who, for many decades, have inculcated America’s children and young adults in the advantages of collective, non-market, anti-libertarian institutions, where paternalistic “empathy” supplants personal responsibility. Here’s the problem with cost-benefit analysis — the problem it shares with utilitarianism: One person’s benefit can’t be compared with another person’s cost. Suppose, for example, the City of Los Angeles were to conduct a cost-benefit analysis that “proved” the wisdom of constructing yet another freeway through the city in order to reduce the commuting time of workers who drive into the city from the suburbs. Before constructing the freeway, the city would have to take residential and commercial property. The occupants of those homes and owners of those businesses (who, in many cases would be lessees and not landowners) would have to start anew elsewhere. The customers of the affected businesses would have to find alternative sources of goods and services. Compensation under eminent domain can never be adequate to the owners of taken property because the property is taken by force and not sold voluntarily at a true market price. Moreover, others who are also harmed by a taking (lessees and customers in this example) are never compensated for their losses. Now, how can all of this uncompensated cost and inconvenience be “justified” by, say, the greater productivity that might (emphasize might) accrue to those commuters who would benefit from the construction of yet another freeway. First, the current high level of government debt, and the projections for the next 25 years, mean that the U.S. government lacks fiscal flexibility…. Second, the current spending patterns of the U.S. government are starting to crowd out everything except health care, Social Security, and interest payments…. Third, large government borrowing means less funding is available for private investment…. It will not do simply to put an end to the U.S. government’s spending spree; too many State and local governments stand ready to fill the void, and they will do so by raising taxes where they can. As a result, some jurisdictions will fall into California- and Michigan-like death-spirals while jobs and growth migrate to other jurisdictions…. Even if Congress resists the urge to give aid and comfort to profligate States and municipalities at the expense of the taxpayers of fiscally prudent jurisdictions, the high taxes and anti-business regimes of California- and Michigan-like jurisdictions impose deadweight losses on the whole economy…. Of all of the notions that have motivated the decades-long rise of incarceration in the United States, this is probably the most basic: When we put people behind bars, they can’t commit crime. The implied corollary: If we let them out, they will…. The t-statistics on the intercept and coefficients are 19.017, 21.564, 1.210, and 17.253, respectively; the adjusted R-squared is 0.923; the standard error of the estimate/mean value of VPC = 0.076. The coefficient and t-statistic for PRS mean that incarceration has a strong, statistically significant, negative effect on the violent-property crime rate. In other words, more prisoners = less crime against persons and their property. If a chimpanzee appears unusually intelligent, it probably had bright parents. That’s the message from the first study to check if chimp brain power is heritable. The discovery could help to tease apart the genes that affect chimp intelligence and to see whether those genes in humans also influence intelligence. It might also help to identify additional genetic factors that give humans the intellectual edge over their non-human-primate cousins. The researchers estimate that, similar to humans, genetic differences account for about 54 per cent of the range seen in “general intelligence” – dubbed “g” – which is measured via a series of cognitive tests. “Our results in chimps are quite consistent with data from humans, and the human heritability in g,” says William Hopkins of the Yerkes National Primate Research Center in Atlanta, Georgia, who heads the team reporting its findings in Current Biology. Such findings are consistent with Nicholas Wade’s politically incorrect A Troublesome Inheritance: Genes, Race and Human History. For related readings, see “‘Wading’ into Race, Culture, and IQ’.” For a summary of scholarly evidence about the heritability of intelligence — and its dire implications — see “Race and Reason — The Achievement Gap: Causes and Implications.” John Derbyshire offers an even darker view: “America in 2034” (American Renaissance, June 9, 2014). The title of this post applies, inter alia, to econometric models — especially those that purport to forecast macroeconomic activity — and climate models — especially those that purport to forecast global temperatures. I have elsewhere essayed my assessments of macroeconomic and climate models. (See this and this, for example.) My purpose here is to offer a general warning about models that claim to depict and forecast the behavior of connected sets of phenomena (systems) that are large, complex, and dynamic. I draw, in part, on a paper that I wrote 28 years ago. That paper is about warfare models, but it has general applicability. successful application of operations research usually results in improvements by factors of 3 or 10 or more. . . . In our first study of any operation we are looking for these large factors of possible improvement. . . . This is science-speak for the following proposition: In large, complex, and dynamic systems (e.g., war, economy, climate) there is much uncertainty about the relevant parameters, about how to characterize their interactions mathematically, and about their numerical values. If you think that models and “data” about such things as macroeconomic activity and climatic conditions cannot be as inaccurate as that, you have no idea how such models are devised or how such data are collected and reported. It would be kind to say that such models are incomplete, inaccurate guesswork. It would be fair to say that all too many of them reflect their developers’ policy biases. Of course, given a (miraculously) complete model, data errors might (miraculously) be offsetting, but don’t bet on it. It’s not that simple: Some errors will be large and some errors will be small (but which are which? ), and the errors may lie in either direction (but in which direction?). In any event, no amount of luck can prevent a modeler from constructing a model whose estimates advance a favored agenda (e.g., massive, indiscriminate government spending; massive, futile, and costly efforts to cool the planet). Even after rigorous testing, a model is never proven. It is, at best, a plausible working hypothesis about relations between the phenomena that it encompasses. A model is never proven for two reasons. First, new facts may be discovered that do not comport with the model. Second, the facts upon which a model is based may be open to a different interpretation, that is, they may support a new model that yields better predictions than its predecessor. The fact that a model cannot be proven can be take as an excuse for action: “We must act on the best information we have.” That excuse — which justifies an entire industry, namely, government-funded analysis — does not fly, as I discuss below. Relatively few people are both qualified and willing to examine the parameters of a numerical model, the interactions among those parameters, and the data underlying the values of the parameters and magnitudes of their interaction. It is easy to “torture” or “mine” the data underlying a numerical model so as to produce a model that comports with the modeler’s biases (stated or unstated). There are many ways to torture or mine data; for example: by omitting certain variables in favor of others; by focusing on data for a selected period of time (and not testing the results against all the data); by adjusting data without fully explaining or justifying the basis for the adjustment; by using proxies for missing data without examining the biases that result from the use of particular proxies. Are the data underlying the model available to the public? If there is some basis for confidentiality (e.g., where the data reveal information about individuals or are derived from proprietary processes) are the data available to researchers upon the execution of confidentiality agreements? Are significant portions of the data reconstructed, adjusted, or represented by proxies? If the answer is “yes,” it is likely that the model was intended to yield “proofs” or “predictions” of a certain type (e.g., global temperatures are rising because of human activity). Are there well-documented objections to the model? (It takes only one well-founded objection to disprove a model, regardless of how many so-called scientists stand behind it.) If there are such objections, have they been answered fully, with factual evidence, or merely dismissed (perhaps with accompanying scorn)? Has the model been tested rigorously by researchers who are unaffiliated with the model’s developers? With what results? Are the results highly sensitive to the data underlying the model; for example, does the omission or addition of another year’s worth of data change the model or its statistical robustness? Does the model comport with observations made after the model was developed? For two masterful demonstrations of the role of data manipulation and concealment in the debate about climate change, read Steve McIntyre’s presentation and this paper by Syun-Ichi Akasofu. For a masterful demonstration of a model that proves what it was designed to prove by the assumptions built into it, see this. The principal lesson to be drawn from the history of massive government programs is that those who were skeptical of those programs were entirely justified in their skepticism. Informed, articulate skepticism of the kind I counsel here is the best weapon — perhaps the only effective one — in the fight to defend what remains of liberty and property against the depredations of massive government programs. Skepticism often is met with the claim that such-and-such a model is the “best available” on a subject. But the “best available” model — even if it is the best available one — may be terrible indeed. Relying on the “best available” model for the sake of government action is like sending an army into battle — and likely to defeat — on the basis of rumors about the enemy’s position and strength. With respect to the economy and the climate, there are too many rumor-mongers (“scientists” with an agenda), too many gullible and compliant generals (politicians), and far too many soldiers available as cannon-fodder (the paying public). The average person is so mystified and awed by “science” that he has little if any understanding of its limitations and pitfalls, some of which I have addressed here in the context of modeling. The average person’s mystification and awe are unjustified, given that many so-called scientists exploit the public’s mystification and awe in order to advance personal biases, gain the approval of other scientists (whence “consensus”), and garner funding for research that yields results congenial to its sponsors (e.g., global warming is an artifact of human activity).